Create a safe, stable, and organised workplace, then maintain its condition and continually strive to improve effectiveness. Standardised work and Standard Operations are key to the elimination of variation and cost reduction. Imagine expecting your workforce to be able to follow a standard procedure in a workplace that changes every time they visit, and with no specific tooling or equipment locations. On top of that the machine condition and reliability is questionable. These are the areas that good 5S implementation addresses. 5S is the corner stone of a Continuous Improvement culture. It is often interpreted as "good housekeeping" but in many instances it fails over time, due to other pressures of work. Good housekeeping is really a function of good management, whether it be on the shop floor or in an office environment. To many 5S has lost its true value by continued over simplification to keeping the workplace tidy, rather than to make it more effective. Lost time looking for things, loosing track of progress, juggling work, should be eliminated. 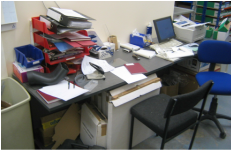 Simple organisation and having only essential items in the workplace eliminates wasteful activity. Everything has a location, is kept where it needs to be to make the job easier, and time is no longer spent doing things that serve no purpose. The person working at the station should understand the benefits of this and contribute to further improvement, but that doesn't take away the responsibilities of the management for maintaining the overall condition. Auditing the workplace against a defined set of criteria will provide a measure on the current state, and hence provide an action plan for improvement. A good Clean and Check regime by the operators will identify problems before the machine fails. Red Tags identify issues that can be integrated into the maintenance system, and are generally identified during the cleaning down of the machine or equipment. Good housekeeping results from basic maintenance activity by the operator. Much of 5S is management and control. A big part of sustainable 5S is attributable to good visual management of the actual work area and its surroundings. Without a standardised environment it is unlikely that you will be able to progress to standardised work. We can tailor a 5S training package to suit your needs. Although the understanding of the methodology needs to be the same at all levels, it is important that everyone understands their individual responsibilities to ensure effective deployment and sustainability.